Tagged Chichibu, Hakushu, Japan, Japanese Whisky, Karuizawa, Marcin Miller, Miyagikyo, Suntory, The Whisky Exchange Whisky Show, Whisky, Yamazaki, Yoichi, Zoran Peric. This Thursday last, we took ourselves along to ‘The Whisky Shop‘ in Birmingham run by Craig Mills. We were there for a preview event featuring a selection of some very fine Japanese whisky before the main tasting event run by Craig and the Birmingham Whisky Club at the ‘Old Joint Stock’ that same evening. We were greeted by the European Brand Ambassador for Suntory Whisky, Tatsuya Minagawa. It was great to hear about the history of Japanese whisky production and about how whisky is produced there today. 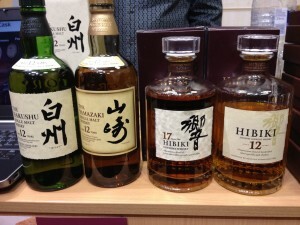 We had four whiskies to try, all from Suntory; Hibiki 12, Yamazaki 12, Hakushu 12 and the Hibiki 17. I [Mike] having never tried Japanese whisky before was really keen to explore these new tastes. Jon has several of these bottlings in his collection, but hasn’t shared them with me! On the nose we got some pineapple, vanilla and orange. This whisky was matured in plum wine casks and we certainly picked up the sweet fruitiness on the tongue. The finish for us was short but sweet. Again it was sweetness on the nose with candied orange peel and marmalade. On tasting we picked up honey, barley and oranges. It was satisfyingly luxuriant on the tongue, oily enough to let the tastes linger. The finish brought more orange and a slight reminiscence of dark chocolate. If we had favourite out of the four, this would be it. We both loved the smokiness and peat on the nose and also picked up a hint of white fruit and grass. On the tongue the subtlety of the flavours made this whisky satisfying and complex, there was more peat, smoke, apples and the smell of grass on a dry summer’s day. Lovely. The finish gave the feel of an unhurried sit by a dying bonfire in the late evening. Jim Murray gave it 95.5 and who are we to argue! We went back for seconds! It had a rich deep amber hue and on the nose the richness came through, Christmas cake, almonds, marzipan, chocolate. On the tongue, we got cherries and more rich fruitiness. It was complex, a step up from the 12 in our opinion. All in all a great couple of hours and we look forward to tasting many more Japanese whiskies and making it to the next Birmingham Whisky Club tasting. If you’re in Birmingham city centre why not pop into the Whisky Shop and have a chat with Craig! Tagged Hakushu, Hibiki, Japan, Suntory, Tasting, Whisky, Yamazaki.